In case you’ve missed recent news, U.S. immigration agents have demanded records from businesses, including restaurants. They are asking employers to prove that their employees are legally eligible to work in the United States. These audit notices can be disruptive. Keep your business running smoothly by being sure you have the required verification and employment eligibility of all your staff. Under federal law, employers are required to verify the identity and employment eligibility of all individuals they hire, and to document that information using the Employment Eligibility Verification Form I-9. Homeland Security uses a three-prong approach to conduct worksite enforcement: compliance, through I-9 inspections, civil fines and referrals for debarment; enforcement, through the arrest of employers, knowingly employing undocumented workers, and the arrest of unauthorized workers for violation of laws associated with working without authorization; and outreach, through the ICE Mutual Agreement between Government and Employers, or IMAGE program, to instill a culture of compliance and accountability. ICE’s worksite enforcement strategy focuses on the criminal prosecution of employers who knowingly hire illegal workers. ICE also uses I-9 audits and civil fines to encourage compliance with the law. A notice of inspection alerts business owners that ICE is going to audit their hiring records to determine whether or not they are in compliance with the law. Employers are required to produce their company’s I-9s within three business days, after which ICE will conduct an inspection for compliance. If employers are not in compliance with the law, an I-9 inspection of their business will likely result in civil fines and could lay the groundwork for criminal prosecution, if they are knowingly violating the law. 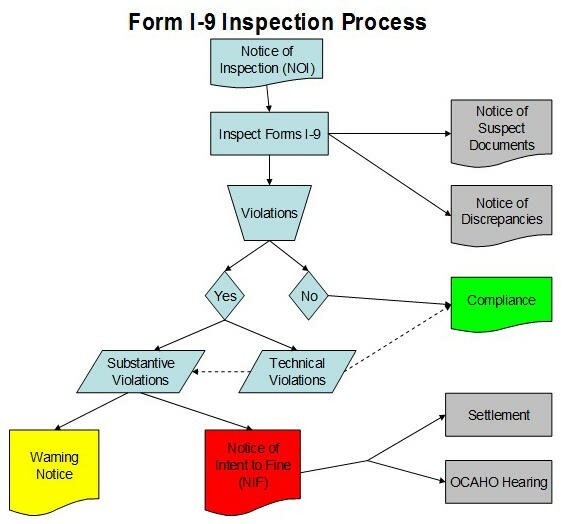 ICE agents or auditors then conduct an inspection of the Forms I-9 for compliance. When technical or procedural violations are found, an employer is given ten business days to make corrections. An employer may receive a monetary fine for all substantive and uncorrected technical violations. Employers determined to have knowingly hired or continued to employ unauthorized workers will be required to cease the unlawful activity, may be fined, and in certain situations may be criminally prosecuted.